All Mackems find the winter months longer and colder. But for the homeless population of Sunderland it is even harder. We will put on a concert featuring acts from the local area, with stalls to raise the proceedings. With the money raised we will produce packages containing warm clothing, food, water etc. This will show that people in the local area do care about the problem of homelessness on there doorstep. Our dedicated group of 20 are passionate in what we are wanting to achieve and making a difference to people's lives, we will also be using our connections with the local soup kitchen at Bethany Church to help make sure everything is done to a good standard. The issue of homeless has become ever more prevalent in our society. The number of homeless people in the UK is on the rise. This is particularly prominent in the North East of England. Many people from the region do not realise how widespread this problem is but are ever willing to help people in particular those close to home. The number of people sleeping rough in the North East increased by 30% from 2013 to 2014. 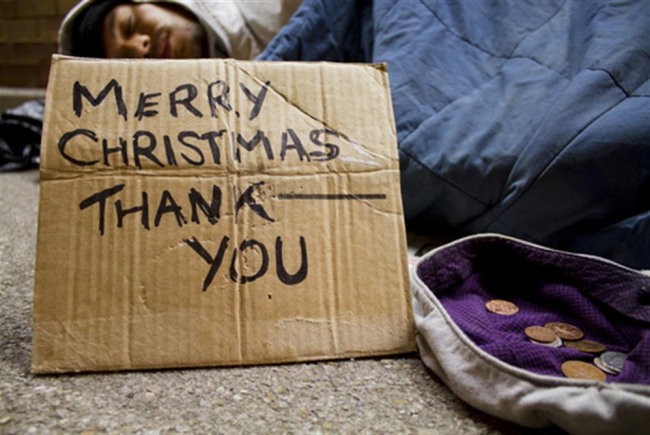 While we are aware we can't completely eradicate this problem, we are able to make those who are affected by homelessness a little bit more comfortable during the festive period. We would like to thank you for the support and donations! We are a group of young people based in Sunderland who intend to provide the homeless with some comfort for Christmas. Project Delivery Manager: Helping Sunderland's Homeless The Project Delivery Manager takes legal responsibility for receiving and spending the funds raised and ensuring the project is delivered. Contractors: Helping Sunderland's Homeless,Helping Sunderland's Homeless The team responsible for building or installing the project.